Our experienced and dedicated team at The Dermatology Center (TDC) provide the latest and most effective skin treatments available to help maintain your beauty and reduce or even reverse the effects of aging. The expert practitioners and aesthetic nurses at TDC encourage you to contact us today for a customized treatment regimen to give you natural-looking, beautiful results. Restylane injections are used to improve frown lines and restore the skin to a more youthful appearance. Restylane® fillers are injectable gels made of hyaluronic acid, a naturally-occurring substance in our skin. Our line of Restylane fillers can be used to strategically enhance areas of volume loss along the facial region, leading to smoother, younger-looking skin. The Excel V Laser System is a new and state-of-the-art laser technology for treating vascular skin conditions such as Rosacea, spider veins and Telangiectasia and pigmented lesions including sunspots. The Excel V Laser System uses a high power green laser to target abnormal blood vessels and pigment in the skin. Click here for Excel V Frequently Asked Questions. Laser hair removal is an ideal solution to unwanted hair almost anywhere on the body. Expert laser treatment guarantees that the unwanted hair is removed without damaging the surrounding skin. At The Dermatology Center, we use cutting-edge Cutera lasers for the most efficient laser hair removal. Chemical peels are a rapid, easy way for patients to regenerate a healthy layer of skin on their face. They work by gently removing the outer layers of the skin, along with any blemishes that exist in those outer layers, such as skin pigmentation or fine lines. 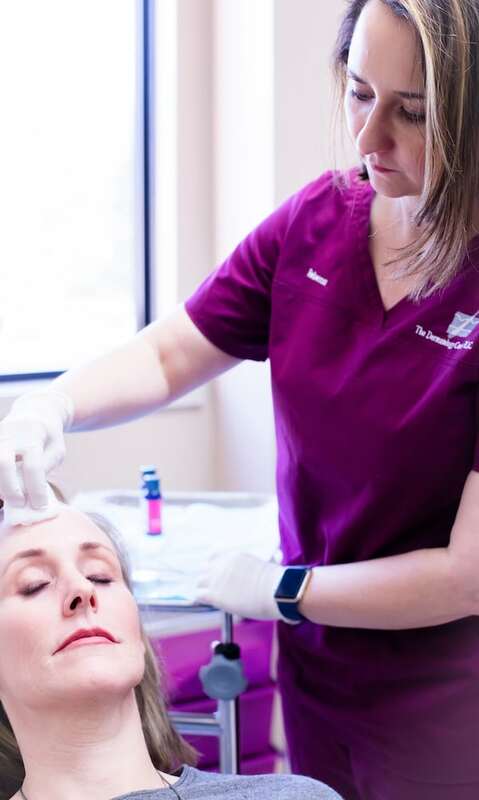 At The Dermatology Center, each procedure is delivered with your individual needs in mind, allowing us to custom tailor your chemical peel for best results. Chemical peels use a chemical solution that is applied to the face. This chemical solution works to remove the damaged layers of skin. After only several minutes, the solution is removed. Over the next several days, the damaged layers of skin will shed, while new layers underneath begin to grow. Overall, chemical peels bring a healthy glow to the skin while reducing the appearance of blemishes. While chemical peels are usually done to the face, they can also improve skin on the neck and hands.